The status of this is not known. 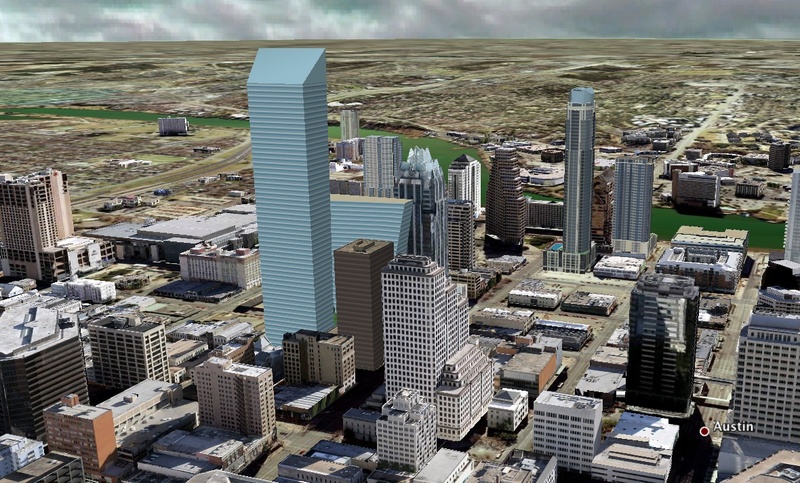 If built it will be Austin's new tallest. Here's a few screen shots from Live Maps showing the block. To the right of the black office tower, there is a 5-story bank building from about 1959 I believe. Behind it is a 4-story parking garage. To the left of it (north) is a 7-story apartment building that also has some parking in it. And there's also another ~7 story building, which I think has some office and retail space in it. It's probably the oldest building on the block. You can see the 4-story parking garage and the 7-story apartment/parking structure here. I'm not a fan of this one, and I'm not sure why. 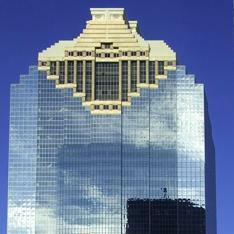 I think I'd prefer something a little more brick-y and a little less glass-y for Austin. I doubt Priller's Google Sketchup drawings along with every other rendering released will look anything like the final design. Hopefully when this gets closer to fruition, we'll see a real design. 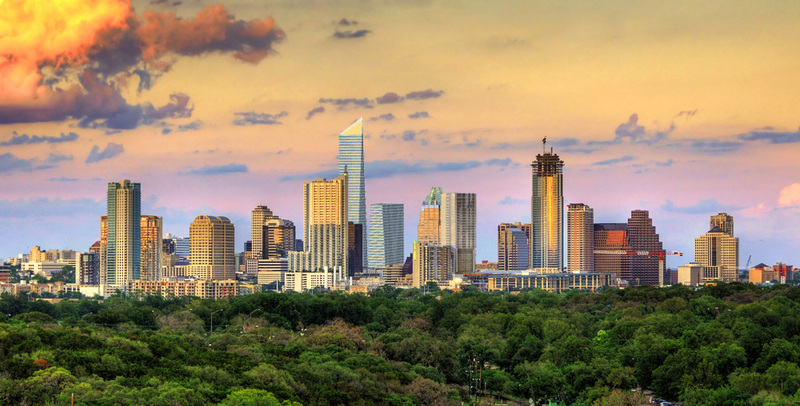 If it turns out like in the picture, it would be a great signature tower for Austin. Looks like a combination of the Citigroup Center in New York and that big new bank building in Shanghai. The only difference between a skyline of these and a skyline of seventies shoeboxes is that these are more menacing, not more artful. If we're supposed to forever swallow that The Architect is being some kind of artist as much as a building contractor, then this is not helping. It, like the previous schemes, is not viable even as mere sculpture. Shame on Pelli. Maybe it's me or maybe it's just this building, but the whole twisted structure doesn't seem like a true fit for Austin. I think it should be more twisty. 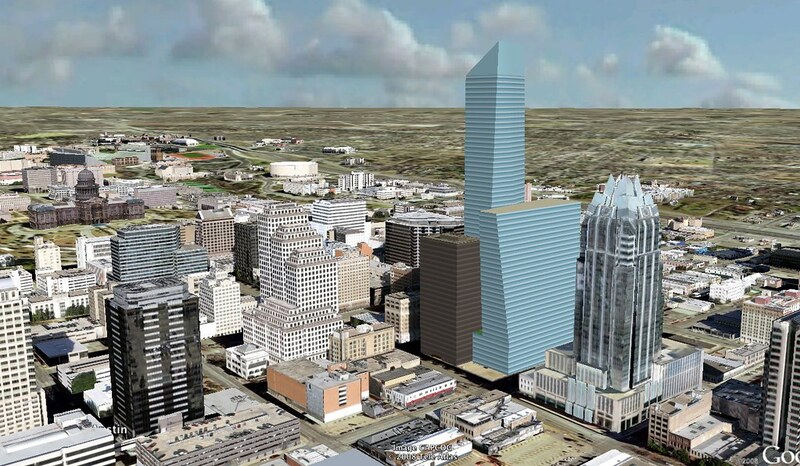 According to the Austin Business Journal, Tom Stacy (a veteran Austin developer) and Walton Street Capital (a $12B investment firm) are revitalizing plans for two dramatic downtown buildings on a key downtown block bound 5th and Congress. 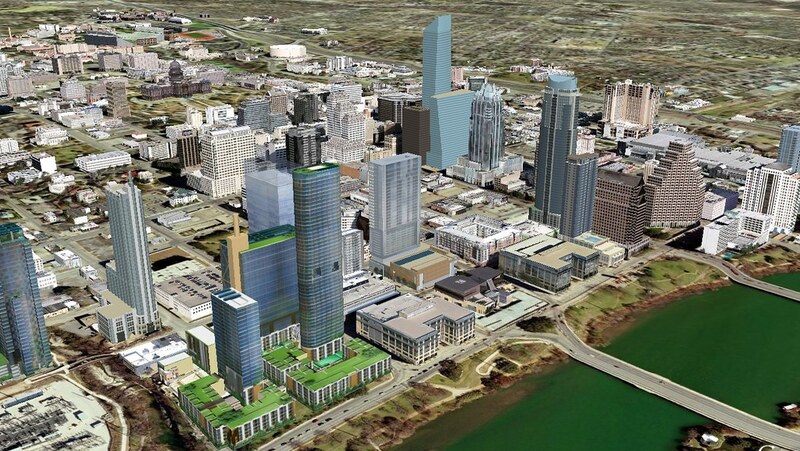 According to the Report, "Developers are moving forward with plans for two new mixed-use towers and a parking garage downtown. . .The new towers are planned for the same block bound by Brazos and 5th Street, plus a half block across the street. Construction on the first phase — the parking garage — is slated for early 2012. Officials said in 2008 they would invest half a billion in the development. One building will be 500,000 square feet and slightly taller than the 26-story Bank of America building, they said at the time. The other was slated for a hotel and condo tower rising more than 800 feet, plus 1,000-car garage, previous reports said." I used to hate that thing but now the design has really grown on me. Maybe its because stuff has changed so much in the last few years. Back when Frost was the newest and tallest "modern" building, I wanted it to set the tone for the rest of the skyline-no boxes, only towers with spires and plenty of ornamentation. 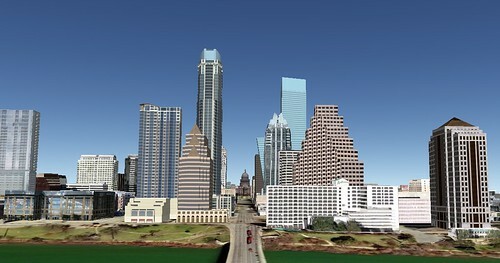 Then all the new stuff got built and gave Austin a different kind of skyline. The 360 and Austonian began to appeal to me more once I saw their appeal.